First of all I would like to extend my heartfelt gratitude for all the sympthay, words and acts of kindness for me and my family during this difficult time in our lives. Please continue to lift us up in prayer because I can still see many obstacles ahead. But these obstacles are opportunities for the Lord to work in my family, and Joe and I want to see that happen. As for our trip — after many hours of flight, little sleep, and non-gourmet airline food —we arrived in Cebu, Philippines earlier this afternoon. We were greeted by my friends Karen and Salome, Karen’s daughter Nicole, and my beloved pastor from Maranatha Church, Pastor Joe DiSarno. They were gracious enough to transport us to my parent’s house across town. The viewing (wake) will be a week-long event, and as has been the custom in my family for many years, it will be held at our home. Our house is the ancestral home that my father inherited from his parents. This house has already hosted three wakes: my grandmother (1983), my grandfather (1990) and now my mother. Many family members and long-time friends have come and will continuously come to the house to pay their respects to Mama and to our family. As for me, it was difficult walking into the house knowing that part of what had made it MY HOME for most of my life would no longer be there. 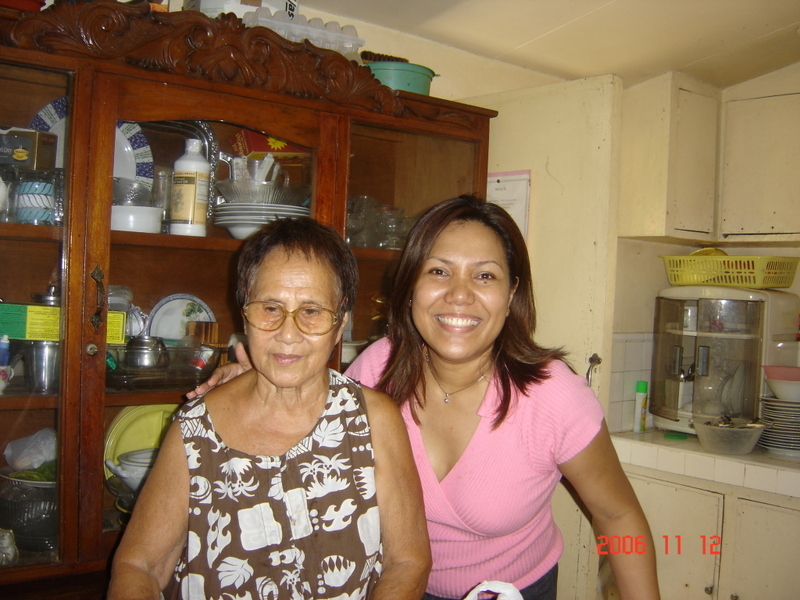 This time it was different – Mama’s smile never greeted me, nor did I see that special twinkle in her eyes that made her face light up(and mine,too) every time I come home….. Needless to say, it’s a terrible feeling, one that I wish nobody else has to go though. But what hurts even further is to see my Dad. While it is difficult for my father to have lost his wife of nearly 50 years, one consolation for him is to know that my mother is not suffering and not in pain anymore, and is now with the Lord. Once the funeral is over, my concern is for my father. They were the best of friends for such a long time and I hope that he would not become too depressed without her. There will be lonely days ahead, I’m sure, but I hope and pray that the Lord will fill that emptiness that happens when you lose someone so close to you. I’ll be in touch and appreciate your comments, prayers and words of encouragement.